The European day starts off with UK retail sales. Following yesterday’s worse-than-expected UK labour market data, it will take a significant positive surprise to improve sentiment towards the pound. The data doesn’t suggest that. 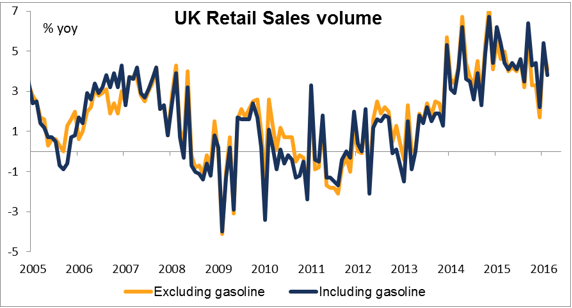 On the contrary, the volume of retail sales excluding gasoline is expected to be lower. This is likely to beGBP-negative, in my view. Then comes the big event of the day week: the ECB meeting. 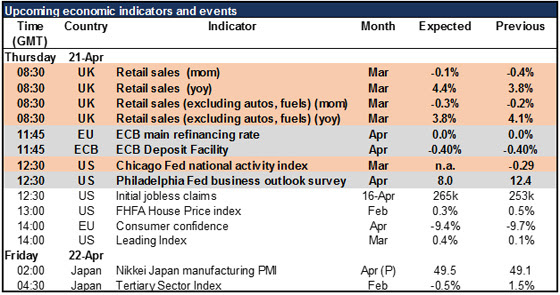 ECB meetings are frequently the most volatile day of the month, but this time is likely to be an exception. The ECB launched a raft of new measures in March but left the details of several unclear and said that they would fill in the blanks in April. So this meeting will probably be devoted to that kind of operational matter, rather than any changes in policy. Questions about lending money to banks and purchasing corporate bonds, while important for bankers and participants in those markets, do not make for market-moving headlines.